It's not uncommon for political activists to suffer injuries on the campaign trail. 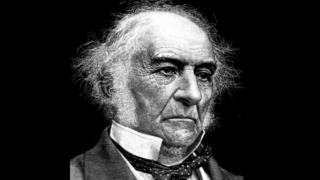 But a particularly unusual one befell William Gladstone when he was fighting the general election in 1892. This general election has seen its fair share of casualties: Lib Dem candidate Stephen Gilbert was bitten by a dog whilst canvassing in Cornwall; Green Party leader Natalie Bennett lost her voice after "too many conversations with voters"; and Labour candidate Polly Billington sustained an ankle injury while out canvassing. Still, modern-day politicians can feel relatively safe in their activities. Violence used to be a far more routine feature of elections. Physical altercations at hustings and polling stations were, according to historians Justin Wasserman and Edwin Jaggard, "widespread and serious" in the mid- to late-19th century. Voting began to grow less dangerous after the introduction of the secret ballot in 1872. But Dr Kathryn Rix of the History of Parliament Trust says elections remained "an exciting event - something everybody got involved with". This febrile atmosphere was maintained in the form of public meetings which were, Dr Rix says, "still hugely significant - an occasion when voters could heckle and barrack their candidates". "The public meeting helped to preserve the politics of disruption right up until the outbreak of World War One," she adds. On one occasion, the victim of this "politics of disruption" was the once and future prime minister. He had the capacity to inspire strong feeling among voters, a reputation built in part by his famous Midlothian campaign. The campaign for the seat of Midlothian in the late 1870s consisted of open-air speeches - often attacking Tory foreign policy - which were designed to appeal not only to the voters who came to see him speak but to the growing numbers of people who would read about it in the newspaper the following day. Dr Kathryn Rix says that the campaign "is generally seen as pioneering in terms of him speaking outside his own constituency during the election" and that "after this it became much more common for MPs to speak in other constituencies during the campaign". It was during his time on the stump that he earned another nickname - "the People's William". But he did not meet with a universally positive reception. Defying the truism that people tend to grow more right-wing with age, Gladstone grew increasingly liberal and even radical as he went on. By the 1880s he had been converted to the cause of Home Rule for Ireland. In this context it was unsurprising that he faced detractors on the campaign trail, but things took a turn for the unpleasant when he visited Chester on 25 June to drum up support for the local candidate. A crowd of five or six thousand was in attendance, and as Gladstone approached the platform where he was going to give his speech, a woman threw a piece of gingerbread at him which hit him in the eye. During Mr Gladstone's progress through the streets there was a most regrettable occurrence. Baron Halkett, who was in the carriage with Mr Gladstone, states that he saw a woman raise her hand and throw something with great violence towards Mr Gladstone. It struck him in the corner of the left eye and inflicted a slight wound and caused bleeding of the nose. Mr Gladstone immediately put his hand over his eye and fell back into his carriage and said to Baron Halkett, "It was a cruel thing to do. I hope some notice will be taken of it." The substance thrown fell upon the knees of Mr James Tomkinson and turned out to be a hard gingerbread nut. Mr Gladstone, on arriving at the club, was seen by Drs. Taylor, Roberts, and Stolterfoth, who were attending the meeting. They examined his eye, which the right hon. gentleman said was very painful. After a delay of about five minutes he appeared on the platform and was received with loud and long-continued cheering. He was clearly unhappy about the assault he had been subjected to, recording in his diary that the missile had been flung by "a middle-aged and bony woman with great force and skill about two yards off me" into his "left and only serviceable eye". Later, he received treated in the Chester Infirmary, according to the Times. But, as the historian H. C. G. Matthew details in his biography, the prime minister continued to experience problems with his eye in the ensuing weeks and months, and it "marked the end of his ability to rely on his eyesight". In the immediate aftermath of the event, however, Gladstone the candidate managed to turn the assault to his advantage. He began his speech to the assembled crowd by saying: "Our opponents have apparently found it rather hard to keep the field in argument and consequently they have unnaturally resorted to other weapons." The quip was greeted with laughter and cheers, before he went on to rail against what he called "religious bigotry" among opponents of Home Rule. He became prime minister again after the subsequent election, lived another six years and died at the age of 88. Meeting potential voters on the campaign trail can be fraught with danger for any politician seeking election, as a quick delve into the BBC archives displays.